Refrigerated truck, sometimes we call it reefer truck box body. Sometimes we call it freezer truck box body. Sometimes chiller truck box body. Sometimes cold room truck box body. 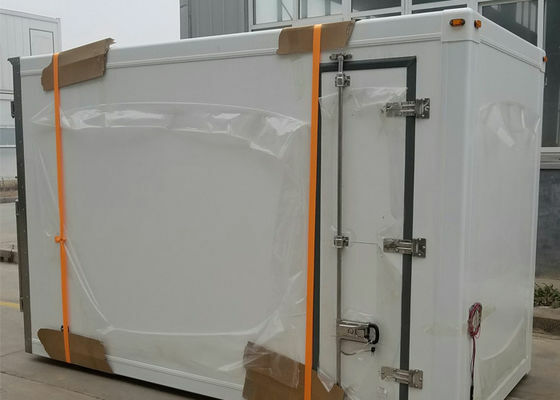 All in all, We calls it refrigerated truck.Reefer truck box body is a kind of box which can load the cargoes which need to keep cold and fresh. Such as icecream, chill chicken, chill fish, freezer meat, sometimes vegetables and so on. Our refrigerated truck box body is the Sandwich structure. External FRP material+PU core+Internal FRP. Normally, the thickness of FRP is 2mm. It also can be customized. As the PU core, normally, the density is more than 40kg/m. And the thickness is changeable by customers’ request and designing request. The parts of FRP reefer truck box body is adopted the highest configuration. They are 304 stainless steel parts for door lock and door frame. Aluminum profile for connecting all the panels. The importing rubbers make the door be sealing. So the whole reefer truck box body is all-closed without any gap. Designed Special FRP/GRE Profile for easy assembling and good outside views, we choose the German GRE Lamilux with Poren PU core insualtion material to make the best quality sandwich panels and box for Advantage Country. Insulation Material All panels, Floor & Roof of the box will be insulated with POLYURETHANE foam (PU) of density 45KG/M3, which can carry the Thermal Conductivity value 0.3kcal/M3. Construre a.Top Fiber Glass Layer : 1.5mm Firber Glass Panel of LAMULUX High Impact Type from Germany. e.Bottom Layer: 2mm Fiber Glass Panel Of LAMULUX HG 400 Type from Germany. f.Enforcement of built in Square GRP Tube cross members (85.5*60*2.5mm) to keep the transverse force condition of the panel. options: aluminum checked plate ,aluminum channels as repuired. Construre a.Outside Fiber Glass Layer : 2mm Firber Glass Panel of LAMULUX HG 400 Type from Germany. c.Inner Fiber Glass Layer: 1.5mm Fiber Glass Panel Of LAMULUX IMPACT Type from Germany. Construre a.Outside Fiber Glass Layer : 2mm Firber Glass Panel of LAMULUX Woven Fabric Gelcoat from Germany. Fiber Glass Profile We have the Special Designed Fiber Glass profile for Kits's assembly,which is much stronger and Healther than the Aluminum. External ANGLE Extruded angle 140 x 140 x 2mm,Made of Fiber Glass To protect the corner and the side of the box. External wrapping Edge Made of Fiber Glass to assembly the Kits to Box and protect the side edge of the Box. Rear Door Door Open Type 2 wing rear doors with GRP outer and inner skin, full open . Options: 3 wings rear doors, Tail Lift at the rear. Door HardWare The accessories fitted with the door is made of stainless steel. 2 nos. container type locks plus door retainers. Door Holder & Stoppers 2 Sets of stainless steel door retainers fitted strongly on built in plates inside the panels. 2nos. of rubber made stoppers. Lights Internal : Internal light LED type 24V-8W, 2 no’s moisture resistant. Fixed in the roof. External : 2+2 no’s light, at front and rear at top,front is white, rear is red. Front Panel Reinforcement For Refrigerator Assemble Plywood Plate(Refrigerator<=50kgs) or Square Fiber Glass Tube (refrigerator>50kg) designed as supporting frame to carry the cooling unit safely, suitable for THERMO KING or Carrier . Drain Pipes 2 nos. PVC and Aluminum U-pipe,42mm dia. drain with drain cap at the front end. Plastic Curtains Side Door PVC plastic curtains 3mm thick x 200mm wide, overlapped, long enough to cover the full height of the Side door. The curtains are hanging on female stainless steel part joined to the male part fixed on the roof. Producing Equipment And Technology 1. A whole Technology Team from German whos are retired from Koegel,Schmitz Cargobull AG,Krone and the University of Germany. 2. 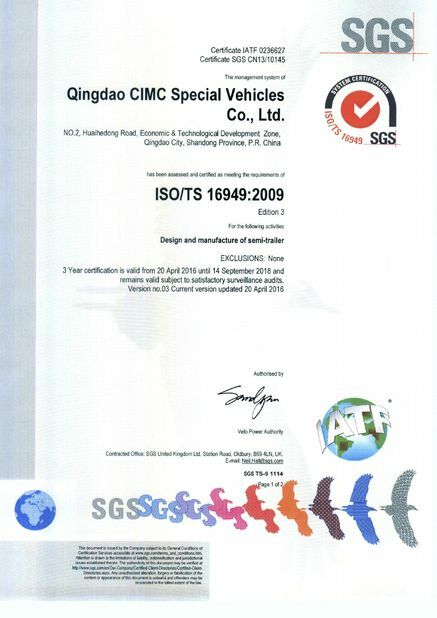 Adopt the know-how and special equipments of Germany to produce the sandwich panels of refrigerated & insulated truck with Dry-IN-Dry method and at the Special Workshop with constant temperature and humidity to keep the quality of composite process of the PU , GLUE and Fiber-Glass. 3.All the Side-Door cut from the Complete panel to keep Intergrity of the panel and the good looks-View with an 13m engraving machines. Box Constructure 1. The whole van body is made up of six panels:Floor plate, Front wall, Two Side wall, Roof and Rear wall portal. Self-supporting body, without cross bars inside and outside skin made of glass fiber reinforced polyester. 2. Use the Special Designed Re-forced FiberGlass Profile to assemble the box.Make the installation easier and Faster ( 1 unit Box/Hour) at any place. Transport at kit type to save the freight. 3. For Stainless Steel, excellent insulation value is obtained. (No heat conductivity). Thick wall door with 5 fold seal. Door lock with optimum contact pressure. Box Character NON-FERRO PLAST kit is an insulation and freezing box set with high consisting prefabricated elements made from high-quality Fiber Glass materials, with high-strength fiber glass Profile for fast and simple installation. Non-Ferro can let the body get a good insulation function and light dead weight, we also Using an adhesive joining process to employ this material to construct boxes with completely vapour diffusion-tight surfaces to get better insulation and balance temperature inside. 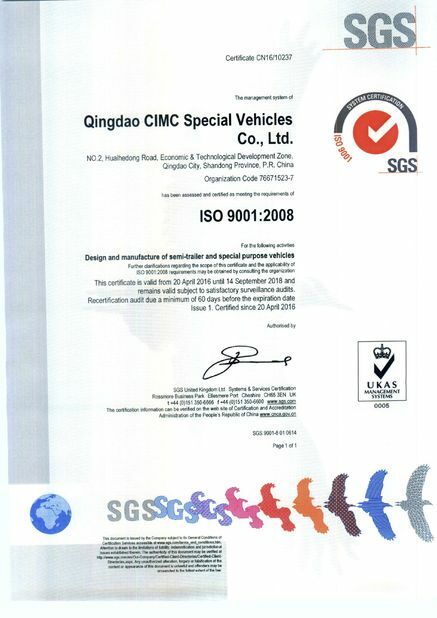 It is suitable for all vehicle brands and models. 3. No-Metal to keep good insulation function and light for more capacity. 4. Completely vapour diffusion-tight surfaces to get better insulation and balance temperature inside. Standard assembly tools, i.e. pneumatic screwdriver, wrenches, etc.